Breakfast meeting for businessmen and pastors held by the Treasure Coast Christian Alliance. 7:30 AM-9:00 AM at the Port St. Lucie Civic Center, 9221 SE Civic Center Pl, Port St. Lucie, FL 34952 – Ruby Hall. Tickets are $10. FFPC President John Stemberger will be the keynote speaker. Call Christopher Fogel at 772-461-5511 or email cfogal@cricpa.com for tickets or additional details. Friday, March 29, 2019 and beyond. The remarkable pro-life movie “Unplanned” opens in theaters. Abby Johnson was the youngest Planned Parenthood director in the organization’s history. But one day, she was called on to assist with an abortion. That moment changed everything. Watch her true story in theaters nationwide on MARCH 29TH! Invite your friends, family or bring your church group to the premiere! You will not want to miss it! FFPC President John Stemberger calls this film “One of the most powerful and moving films ever made.”⠀Watch the official trailer here: UnplannedTickets.com/videos. Find an Unplanned showing near you & pre-buy tickets here: UnplannedTickets.com. Florida Capitol Project bringing pastors to elected officials for prayer. In partnership with Iowa’s The Family Leader, we launched the Florida Capitol Project to connect pastors with legislators to simply pray for and minister to them. If you’re a pastor and interested in coming to Tallahassee to pray with and build relationships with our elected officials, please visit FloridaCapitolProject.org or contact Marty Stubblefield, Director, at (850) 510-0700 or Marty@FloridaCapitolProject.org. Print out this flyer and give it to your pastor asking him to participate. Show your support, hear from your legislators and pro-life leaders and rally for life. There has never been a more important time to stand for life in Florida. Join us at the historic Capitol front steps between the old and new Capitol, 402 South Monroe Avenue, Tallahassee. Flyer for the event here. FFPC President John Stemberger will be the special guest speaker. Meeting will be held from 5:30-7:30 PM CT at Grover T’s BBQ Restaurant, 5887 Highway 90, Milton, Florida 32583. Email santarosagop@gmail.com for more information. 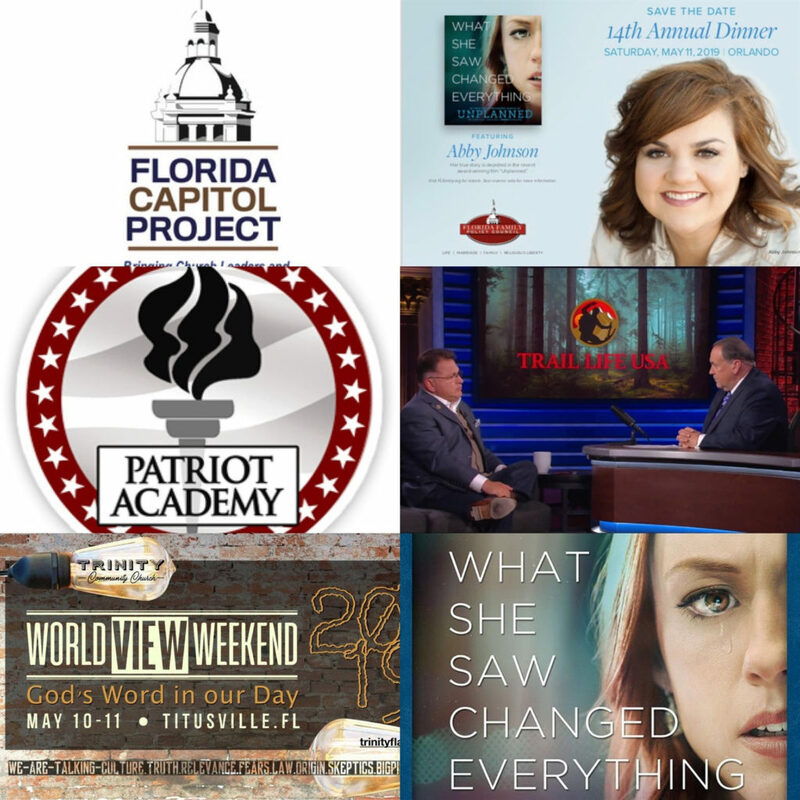 Join us for this exciting apologetics conference at Trinity Community Church in Titusville! FFPC President John Stemberger will be featured as a special speaker Fri, May 10, on the topic of “Navigating God’s Law, Man’s Law & Apologetics in an Anti-Christian Culture.” For more information about the conference or to get your tickets, visit: TrinityFla.org/Conferences or call the church office at 321-268-8004. Register now for this intensive 3-day leadership and Christian worldview program in Tallahassee for Florida students aged 16-25! Patriot Academy SE is a valuable opportunity for students to learn firsthand important leadership strategies and determine the answer to one major question: “What is my purpose in life?” Students will also learn a founding father’s philosophy of government from a biblical worldview, be immersed in the legislative process, develop media relations and public speaking skills, practice campaign techniques, and more! This training is relevant and beneficial to all students regardless of their field of study. Register here (Early bird rate until April 1st!). Email info@flfamily.org to learn more. Download the event flyer here to give to other young people and help promote the event.